Elvira Mistress of Felinity, here! 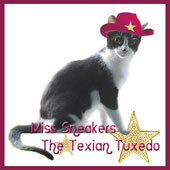 8 weeks until the 500th edition of Carnival of the Cats! We invite you to spread the word and join us in the celebration of the oldest pet related carnival on the internet! 1. Over at Strange Ranger...tribute was paid to the memory of Ivy, a mostly black cat, in honor of National Black Cat Appreciation Day. 2. Speaking of black cats, over at Catsynth... there is is the lovely, always entertaining, Luna. 4. Over at Marian Allen's blog...Caturday, with our friend Katya Graymalkin, has a pair of British feline visitors, a mostly black cat and an all black kitten! 5 and 6. Mostly black cat, Abby, of Manx Mnews, went to the Bridge on the 12th and all this week there have been a most remarkable series of blog posts in the aftermath. 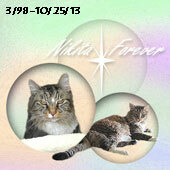 Mr. Nikita, Daddy Kiril and I send purrs and purrayers to all at MM. 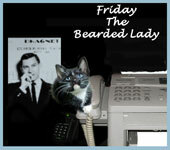 Over at Life From A Cat's Perspective...the gang shares a moving poem, as tribute...The Purry Gates. 7. 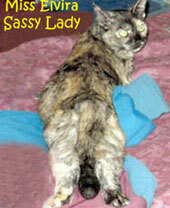 Over at Cat Chat...Another tribute to Abby, and another moving poem for cats. 8. Over at House of the Mostly Black Cats...13 ways black cats rock! 9. Over at Brian's Home...Meet Precious, a mostly black cat. 10. Over at Zee & Zoey's blog...Blackie’s Story – A Special Guest Post by Liz Wyman of Cats Love Naps that is a remarkable and moving read. 11. Over at Mind of Mog...Get a load of Ritzi resting! 12. Over at Cokie the Hollywood Insider...A wonderful infographic about senior pets! 13 thru 15. Meanwhile, here, it's been an interesting week. 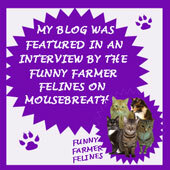 Bet you didn't know worms can get frustrated and even have issues with cats, hee, hee! Seen and Heard 30: The Early (or maybe late?) Worm Gets Soaked! Oh, and some bats, in Houston, freaked out when Daddy Kiril tried to inquire about cats. Seen and Heard 31: This is Just Batty! And, finally, I did something I have never done before. Don't ask me to explain it! Agree, or disgree, with his politics, we all share one thing in common with radio legend Rush Limbaugh; a love of cats. On his 8/16 show: "I would not have been able to describe this or tell you about this any earlier than today literally without losing it, but we had to put Punkin to sleep a week ago. She was 16 years old, and the first cat that I'd ever had, and ended up being the best pet that I've ever had. I'd always thought that cats were these aloof creatures that couldn't care less if you were around or not. And to strangers and so forth, they might be. But when a cat attaches to you, some might say when a cat loves you, it's entirely different." thanks so much for mentioning us!!! We love you! Wish you were going to be at BarkWorld! You are welcome Caren, my friend. I've heard of Barkworld. Maybe next year. 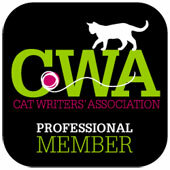 I am going to try to attend the Cat Writers' Association Conference in October, though.